A Healthy Skin Diet is Like the Heart-healthy Diet. Skin is the largest organ in the body. 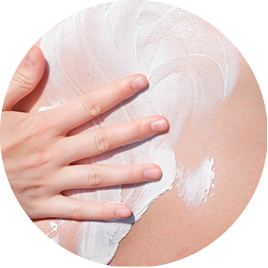 Skin serves as a protective barrier to help prevent harmful substances from entering the body. Damaging sun rays, chemicals, pollution and smoke all can affect the skin. Therefore, if we really want to protect our bodies, we need to commit to protecting our skin and making it a powerful barrier. Similar to other organs, our skin requires special care for optimal function. Two of the most important barriers protecting the skin are sebum, a substance secreted by sebaceous glands to reduce water loss and prevent infection, and pH (alkalinity or acidity). The low pH of the skin’s surface helps protect against disease-causing bacteria. Factors such as the sun, pollution, chemicals, smoke, tanning beds and continual hand-washing with antibacterial soaps can break down the skin’s essential barriers for protection. These environmental and behavioral factors can lead to damaged skin as a result of the oxidation process. Continued sun exposure can result in dry, flaky, wrinkled, aged skin and potentially skin cancer. In addition to applying sunscreen, consuming antioxidants from foods may offer some protection against these damaging factors. Plant-based foods such as fruits, vegetable, beans and nuts/seeds are good sources of natural antioxidants. Keep your skin moisturized with lotions containing natural oils and ingredients. Wash your hands for at least 20 seconds when you wash.
Use alcohol-based sanitizers if hand-washing facilities are not available. However, alcohol may cause your skin to become dry or cracked. *Before making major changes in your diet, visit with a health professional. Drinking plenty of water and fluids is essential for healthy skin. Getting enough fluid helps your body absorb water-soluble nutrients and helps carry nutrients and oxygen to cells. We lose fluids through urination, bowel movements, breathing and sweating. One sign of adequate fluid intake is consistent light-colored urine. Fluid needs vary for every individual depending on several factors. Your activity level, your weight and height, health status and environmental factors all influence your fluid needs. For short bouts of exercise (less than an hour) be sure to hydrate before you exercise; for longer periods of exercise, drink at least 6 ounces of fluid every 15 minutes. For the average person, about 81 percent of fluid needs come from water and other beverages and 19 percent comes from water in food. On average, women should get 9 cups of water and/or fluids from beverages and men should drink 13 cups. Focus on your intake of fruits and vegetables because they contain the most water. You need additional fluids if you have increased fluid losses from sickness, sweating, urination, vomiting, diarrhea, fever, pregnancy, breastfeeding or living at a high altitude. Keep a pitcher of cold water in the refrigerator. In 2009, the World Health Organization and the International Agency on the Research for Cancer classified tanning beds as “carcinogenic to humans” and placed them in the same category as arsenic, asbestos and cigarettes. Tanning bed use before the age of 30 was shown to increase skin cancer risk by 75 percent. Despite the claims, tanning beds are inefficient at increasing serum vitamin D levels, even for those most at risk for vitamin D deficiency. Skin cancer is the most common malignancy in the world. Factors such as skin type, previous history, tanning bed use, unprotected sun exposure, smoking and poor diet all contribute to increased risk. According to one study, self-checks of skin may decrease mortality from melanoma by 63 percent because doctors do not routinely check for skin abnormalities. Get to know your skin and when it changes. If you notice a suspicious spot, don’t hesitate: Get it checked right away. Apply a broad spectrum sunscreen with a sun protection factor (SPF) of 30 about 30 minutes before going outside. Reapply sunscreen every 1.5 to two hours and after swimming or sweating. Wear protective clothing such as tightly woven clothes and a wide-brimmed hat. Take advantage of the shade or limit being outside between 10 a.m. and 4 p.m.
*Exposure to sun promotes the production of vitamin D in your body. Sufficient vitamin D can be attained with only five to 30 minutes of midday sun exposure to the face, arms, legs or back twice per week for healthy individuals during the spring, summer and fall; a vitamin D-rich diet; or a supplement. The current recommendation for vitamin D is 600 International Units per day.